Throughout the years, soybeans have earned conflicting ratings from health experts and consumers. It is true that not all soybean products are good for your health. But, there are various kinds of soy foods that can offer nutritional and health benefits. Fermented soy products are among these products. With that said, in this article you'll read about the most common kinds of fermented soy foods. This article will also offer some tips on how to include these products in your meals. The fermentation process is an ancient food preparation method that involves microbial species. This technique was typically done to prolong a food’s shelf life. As time goes by, researchers have found that this ancient practice can also offer other benefits aside from food preservation. In my earlier article about soybean products, I've mentioned that fermented soy foods are the first edible soy products. This is because soybeans contain substances that can cause some health problems. This is especially true when you consume these food products in high amounts. But, with the help of various microbial species, these problems are evidently reduced. Furthermore, microorganisms can also improve soy’s digestibility and bioavailability of essential nutrients. In a gastronomical point of view, fermentation also unleashes soy's umami flavor. Known as the fifth taste, umami is best described as an addicting savory zest. It is the lingering aftertaste in your mouth after a snack or a meal that lets you crave for more. This effect is brought to you by an amino acid known as L-glutamate. This is one reason most of us love French fries, potato chips, meaty meals and cultured products like cheese. It is because these food products have high amounts of glutamate. As of today, you can find various kinds of fermented soybean products. While they are essentially made from the same legume, each has their own unique attributes. These differences are due to the various preparation methods and microbial species used to create them. With that, below is a list of the most common examples of fermented soy foods you can find in today’s market. Known for its unflattering smell and texture, a lot of people have avoided natto. But, don’t let these factors discourage you. Like other cultured foods, its taste is actually tolerable and likable after a few tries. Plus, did you know that this fermented soy product is a powerhouse of nutrients? Yes, these sticky little beans are on top of the list of healthy fermented foods sold in today’s market. So, what are the benefits of natto? Basically, this fermented soy food is typically cultured with a bacterium known as Bacillus subtilis. Because of this, it is an excellent source of fiber, protein and vitamin B and K2. Aside from that, it also has nattokinase. It is an enzyme found in the sticky thread-like part of this food. Natto's health benefits are mostly attributed to this enzyme. Since natto is generally sold ready-to-eat, you can just eat it anytime. To get the most benefits, you can slightly open the package and leave it at room temperature overnight before eating it. This enables the bacteria to increase its nutrient value in a fast-paced manner. If you’re having a hard time enjoying natto’s unique and exotic flavor, you can always mix it with other ingredients. Vinegar is typically used to soften its strong flavor. It has a great affinity with meat products like steaks and fish. Using them as a side dish is an excellent way to make it more appetizing. You can also add it as an ingredient in your omelet, salad, sushi, rice, pasta and sandwich recipes. Here is a recipe of Japanese-style Natto Spaghetti that you can try. Unlike most soybean products that originated in East Asia, tempeh is initially created from the modest region of South East Asia specifically Indonesia. This is probably why it is not as popular as other fermented soy foods. Nonetheless, it is now gaining recognition in today’s culinary world. Usually cultured with Rhizopus oligosporus, tempeh has a white cake-like appearance. Looking at it from afar, tempeh may have tofu’s physical appearance. But, if you look closely, you will notice a distinguishable feature. This fermented soy food has a lot of grains or bean-like components. The best part, it has a milder and more favorable taste compared to natto and fermented tofu. What is its flavor and aroma? It’s like mushroom with a nutty trace. Compared to natto’s stellar nutrient profile, tempeh is quite inferior. But, this does not mean that tempeh won’t be able to offer some nutritional and health benefits. It is still a good source of protein and fiber. It is also rich in essential nutrients like calcium and vitamin B. When buying tempeh, you can find it in the refrigerated or freezer section of an Asian market or grocery. When purchasing one, always look for a “best before” date. You should also be wary of the signs of over fermentation. It is normal for this food to have some dark-colored spots like black and gray. However, a blue, pink or yellow discoloration is a sign that its fermentation period has exceeded its normal time-frame. With that, a high quality tempeh is best described as dry, firm, has tightly bound beans and a distinct mushroom-like aroma. Like tofu, tempeh can also absorb the flavor of other ingredients. This characteristic makes it an excellent meat alternative in soup, stews and pasta recipes. You can also add it in your sandwiches. Finally, you can always eat it on its own. Some tempeh products are typically sold ready-to-eat. You can just steam it if you want it soft or fry it for a more crunchy texture. This next fermented soy food can probably leave a long-lasting first impression for those brave enough to devour it. Known as the “blue cheese of China,” stinky tofu is an infamous delicacy in Southeast and East Asia. As its name imply, this type of fermented tofu has an aroma that will turn you off. This is due to the ammonia formed during the fermentation process. But, some people attest to its remarkable savory zest that resembles blue cheese. It is commonly said that "the stronger the odor the better its flavor." Stinky tofu is not only discernible via its strong odor. It is also marked with some black and gray spots. In some occasions, you can also find some products covered with a charcoal hue. Deep fried stinky tofu dipped in a spicy or sweet sauce is the most common recipe for this soybean product. In fact, it is regularly sold as a street food in China, Taiwan and Hong kong. But, you can also eat it raw, boiled, steamed and grilled. You can also add it in stew recipes. One important reminder when purchasing stinky tofu is its quality. Most traditionally fermented tofu products have undergone open fermentation. Thus, sanitary issues may arise. But, as of today, there are no studies about the health risks linked to consuming this food. Studies have actually shown that microorganisms found in this food like lactobacillus species are under the “good” or “beneficial” category of microorganisms. Hence, this food may also offer the health benefits found in natto. Aside from that, you also have to be wary of fake versions. As you know, creating this fermented soy food takes months. Because of that, some manufacturers or sellers hasten the fermentation process. This is usually done by altering the traditional brine formula by adding suspicious ingredients. Thus, it is best to only opt for reputable sellers, manufacturers or brands. Keep in mind that there are other varieties of fermented tofu. Those that are typically sold in small jars should only be used as a condiment. This is due to its strong salty flavor and high sodium contents. Nonetheless, its wonderful combination of sweet and salty zest makes it an excellent flavor enhancer. You can use it in rice, congee and porridge recipes. It can also be used as an ingredient for bland soup and dipping sauces. Lastly, you can add its brine and small cubes in braised or stir-fried vegetables. Considered as a staple in Japanese cuisine, soy miso is one of the most popular fermented soy products worldwide. This is not surprising since this Asian condiment can blend well in a lot of dishes. The main microorganism used to ferment soy miso is a fungus known as Aspergillus species. In some occasions like in Chinese-made miso paste, lactobacillus species are also added. Because of this, researches have labeled soy miso as a healthful product. In fact, its fermentation period can positively affect the health benefits it provides. One example is its antioxidant contents. Depending on the length of its culturing period, its antioxidant levels will vary. Hence, the strongest type of soy miso has the highest amounts of healthful compounds. Generally sold as a paste, soy miso’s flavor may range from salty to sweet depending on its type. Typically, these soybean products can last 6 months to a year when refrigerated. Here is a list the most common varieties. Red miso – Red miso has the longest fermentation period. Because of this, it also has the strongest flavor, which is salty with a tinge of bitterness. Thus, this reddish-brown condiment is generally used for making miso soup. You can also use it as an ingredient for marinating and braising meat and vegetables. Always remember that this condiment has a strong flavor. It can overwhelm a dish’s flavor. Thus, it is best to use it sparingly. Yellow miso - Fermented for a year, this golden brown paste is the so-called "all-purpose soy miso." Its earthy flavor lies between salty and sweet. But, compared to its reddish-brown counterpart, its saltness is a bit milder. This condiment is perfect for those who want to include miso in their recipes, but prefer a softer zest. White miso – The lightest among the three when it comes to both flavor and color is white miso. Contrary to its name, this condiment is a light yellow or beige colored paste with a sweet flavor. Some people use this type of fermented soy product as an alternative for dairy. You can also use this in your sauce, soup and salad dressing recipes. For some people, miso is a bit overwhelming for their palate. One remedy for this is to mix two or more types of this paste. This will allow you to create the right blend of flavors for your taste buds. If you like to try Miso Soup, the video below is a recipe you can follow. Another popular and well-liked fermented soy products is soy sauce. Today's modern-day production of this liquid seasoning is already altered. But, naturally fermented soy sauce offers an irresistible umami flavor. Yeast is the most common microbial specie used to ferment soy sauce. But, these products may also contain lactic acid bacteria. Researchers have found that Japanese made soy sauce has Tetragenococcus halophilus. Korean made soy sauce, on the other hand, has Bacillus subtilis. Like miso, all these microorganisms help make naturally fermented soy sauce a healthful condiment. Soy sauce is a widely used condiment in Asian cuisine. This is because it complements a lot of food items from vegetables to meat products. It flavors various recipes like stir fries, soups and stews. It is also a common ingredient in marinates. It can also be used as a dipping sauce for almost anything from grilled meat, fried foods to sushi. While this dark brown liquid may seem like an ordinary condiment, authentic and naturally fermented soy sauce is not so common. To find the right product, a meticulous product label inspection is a must. You should look for phrases like “certified organic,””naturally brewed” and “made from natural ingredients.” Still, this is not a guarantee that you’re buying authentic products. For this reason, it is also recommended to search for legit product reviews. As for storing your open soy sauce bottles, it is fine to leave it at room temperature. But, refrigerating it will keep its freshness and rich umami flavor. What about tamari? Basically, it is a type of soya sauce with a viscous consistency. Furthermore, it has a lower percentage of wheat, thus, the claim “gluten free.” As for its flavor, this type of seasoning has a bolder zest compared to its less viscous variety. For this reason, tamari is typically labeled as a flavor enhancer. Its less viscous counterpart, on the other hand, is known to blend or harmonize a recipe’s overall flavor. As you know over consumption of soybean products may cause undesirable effects. Furthermore, most of these fermented soy foods have high sodium contents. For these reasons, it is highly recommended to regulate your intake of soy-containing food. Being a fermented food, these products contain living microorganisms in it. But, high temperature can kill microbes. Hence, its probiotic benefits can be compromised when cooked. One exception is natto. It is the safest fermented soy product that you can eat raw. As for condiments like miso and soy sauce, you have to add it at the end of the cooking process. Some of today’s fermented soybean products may also contain unwanted additives like monosodium glutamate (MSG). Aside from that, genetically modified soybeans are ubiquitous. For these reasons, inspecting product labels is always a must. This will ensure that you’re purchasing safe and high quality products. If you’re searching for other kinds fermented foods that can offer probiotic benefits, cultured vegetables like Kimchi or Sauerkraut are also recommended. These products are nutritious and can offer a long list of health benefits. As presented above, there are numerous soy products available today. There are also various ways to cook these items. 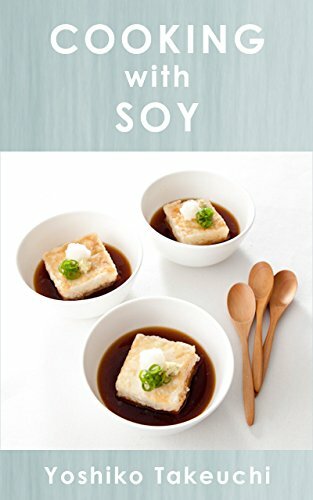 This cookbook offers more recipes and ideas on how to prepare soy foods. Interesting article. Although I have not made the acquaintance of stinky tofu, I do have a passing acquaintance with natto and can attest that it is definitely an acquired taste.